Happy Friday! 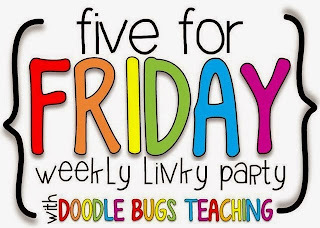 I'm linking up, as I LOVE to do, with Doodle Bugs Teaching for Five for Friday. Thanks, Kacey! 1. 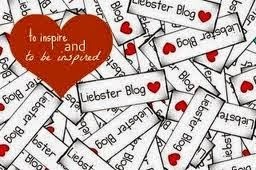 Calling all Liebster bloggers! If you accepted a Liebster Award there is a new link-up for you! 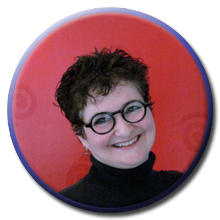 When I first saw a Liebster Award on a blog, and then later when I was nominated for one, I went looking for info. 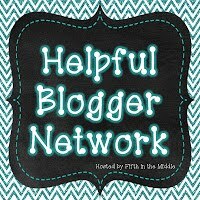 After I did the work of accepting, I thought, hey, other people are going to wonder what this is, and how to find bloggers who have it, so let's gather info and bloggers together. If you're curious, click on the award to find more info. And if you are a Liebsterer (is that a word?) 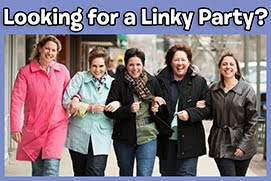 then be sure to link up to find new readers. 2. In my long career as a teacher I've had just about EVERY kind of classroom pet: rabbits, guinea pigs, hamsters, mice, turtles, newts, frogs, crabs, anoles, even snakes, to say nothing of visiting baby squirrels, raccoons, and opossums... no, the kids didn't get to touch those very adorable, but WILD critters. I really like animals, so much so that a friend jokingly calls me St. Kathleen of Assisi. And I very much believe in having kids learn about animals in hands-on ways. 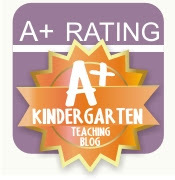 HOWEVER, kindergarten is not what it was years ago... she says needlessly. And no matter WHAT, pets take extra time and expense which now must go to other things. So this year, as we embarked on the pet unit, I went to the pet store with EASY in mind. I was thinking hermit crabs, but when they told me that the substrate had to be completely emptied and changed weekly– cha-ching– and the temp had to be at least 75 degrees all the time (what classroom is above 62 these days?) and maintain high humidity... well, I changed my mind. Kidpeople are now the proud adoptive parents of three guppies– two females and one male– and a snail who is probably more fun to watch than the fish at the moment. With any luck, however, the guppies will do what guppies do, and we'll have lots of baby guppies in short order. I got the special floating nursery so the laws of the sea won't rule– you know, bigger fish eat the smaller fish, even when the bigger fish just gave birth to the smaller ones. Years ago I had guppies and it just so happened that the bowl was at home during break and on our kitchen table when Mama Guppy delivered! The four Wrights spent all dinner mesmerized as we watched this wonderful glimpse of live birth. These little specks, all eyes with a tiny hair of a tail, and more like mini-tadpoles than fish, started zipping around the tank, all naturally searching for a place to hide. Guppies are "livebearers" and they give birth to dozens of "fry" at a time. It is REALLY neat to see. I'm so hoping the kidpeople and I can catch this spectacle again. And if not, there are various videos on YouTube to watch. Caution: some of those videos have commentary not suitable for kindergartners. of the bowl make for nice effect. The snail is right on the front of the bowl, and you can see one of the guppies outlined nicely. All of them dashed to the front of the bowl when I got out the camera... figures I have hambone fish! Floating on top is a water hyacinth that I rescued from my pond before the first frost came. I don't know how long it will last in the bowl, but it saves me buying other water plants for a while. Competing for attention is the small castle in the bowl- the kids tell me mermaids live in it. Who needs fish when you can have mermaids! Let this year's pet adventure begin! 3. In case you didn't see my post earlier this week, I have a new FREEBIE up on TPT. 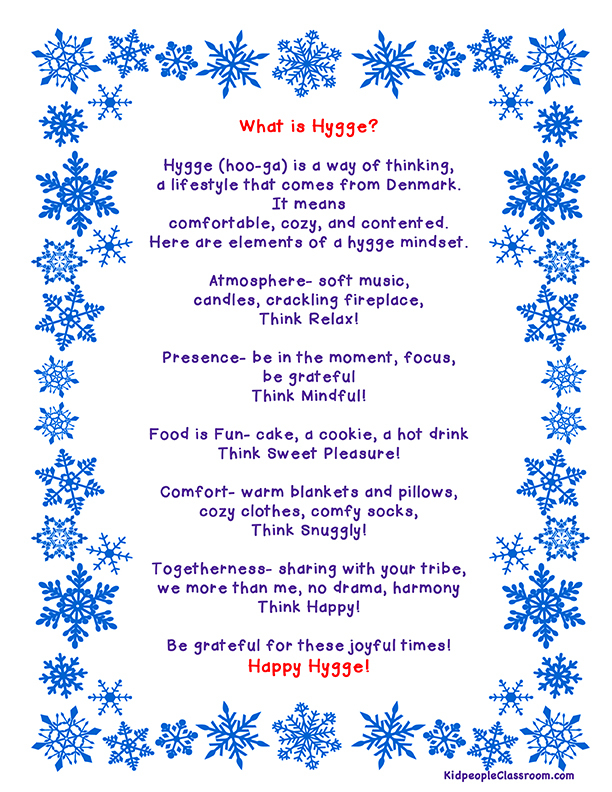 It's a goodie for November– a poem for the pocket chart and TWO different class books for the kids to contribute to. Lots of classrooms make "No" books in NOvember, in which kids list things that are no longer around when we reach November. For example, "No leaves on the trees," or "No more sandals." Well, I included a template for this "No book" just to make things easy for you. 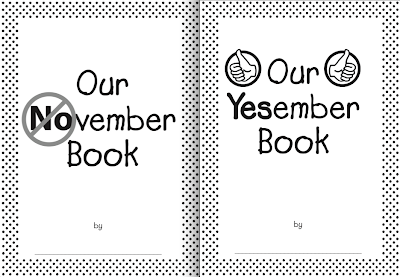 Then I went one step further and gave November a positive spin by making a template for a "YESember book," where kids can list all the things that they CAN do in November that they couldn't do before, such as have Thanksgiving, wear sweaters, and jump in leaves." 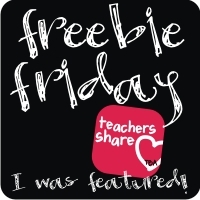 Click on the book cover below to download this Freebie from my TPT store! 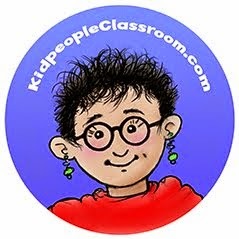 NOvember and YESember class book FREEBIES! 4. AND if you choose to teach the words No and Yes to the kids with the help of the books, then I have a silly game for you, too. Do you remember the old jumprope rhyme about the train? Well, I turned it into a kindergarten spelling game. 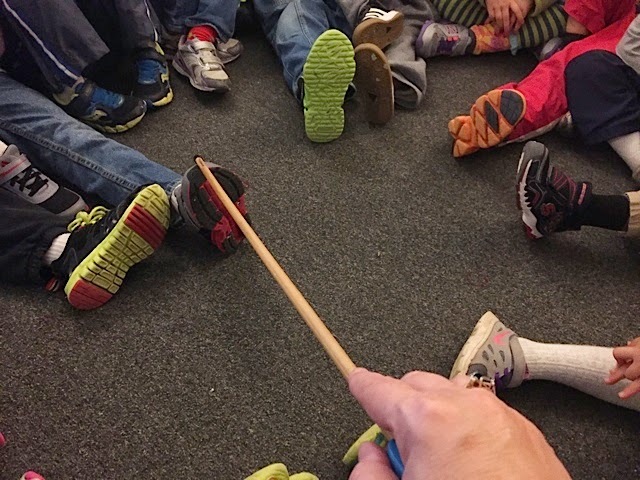 All the kids sit in a circle with both feet pointing in. It is a tight circle, and as I'm sitting in the circle, too, all the toes are hard to reach. I use my long handled tapper to reach everyone around the circle. We go around the circle with me tapping each shoe and saying the rhyme. The one tapped on "back" gets to answer yes or no, and then I continue tapping as we end the rhyme, and the "out" toe gets pulled back from the circle, to the moan of the outed player. They sit there getting out one by one, each one thinking they've lost, because that's how most games go. Here's where the game gets interesting. I continue tapping until we are down to just the one last grinning player, then ask, "So who won?" Everyone shouts the last child's name, of course. Then I say that in THIS game everyone who gets OUT wins! Now there are shouts of joy, except for the last fella who thinks he's lost afterall. But the game's not over yet! I repeat the rhyme one more time, taping this one last toe with every beat, until he is also out, and a winner. I point out that sometimes "out" doesn't mean you're the loser, and there's always a way to let everyone win. I surprise them all by whipping out a Skittle for each child. Whoot! We never get a prize when we win games in class! I end up with a happy, winning crew, all of whom can spell NO and YES quite well! 5. 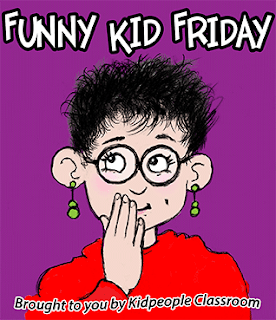 Okay, it's not officially Funny Kid Friday, but it is Friday, and I do have a tale to tell from this week, so I share... minus the link-up. Do you have any "Factoid Boys" in your class? I hate to sound gender biased, but most years I have a couple little boys who just latch on to random facts in the biggest way. They tell me details about black holes and volcanoes, and all sort of interesting science-y stuff. Girls can do this, too, of course, but over the years it has been mostly boys, and so a teacher friend and I refer to them as Factoid Boys. This week I introduced the magic of 32... 32 degrees that is. I explained that's the temperature at which water freezes- even the dew on the grass in the morning freezes and become frost. I told them that it was supposed to get down to that in the coming nights, so every morning when they get up they should quickly look out the window. They might see the ground is white and it won't be snow, but frost. I was pleased with my little enrichment lesson that wasn't in the kindergarten curriculum, and was about to move on when my favorite Factoid Boy's hand flew up. This little guy rarely puts his hand up, preferring the blurt-out method of discussion, so I felt I had to encourage this and called on him. And what did he say? "Now, we REALLY need to discuss Farenheit and Celcius." It is kindergarten I'm teaching, right??? Click on Five for Friday for more fun! Love your new pets!!!! Thanks again for making the amazing link up for Liebster winners!!! Love the look of your tank with the purple lights! I think I want some fish now! Glad you like it! Both cheaper and easier than tank lights! Have fun with your fish! Hi Kathleen! I LOVE your fish bowl. They will love looking at that. I too have some factoid boys (and they will forever be called that...perfect). One of mine is for sure going to be a nuclear physicist. He loves all things related to nuclear energy, etc... I get information on reactors and energy as well as nuclear submarines! Have a good weekend! Good luck with your guppies! You've given them an awesome pad to live in =). I love your Liebster link up. I added my link even though it's from last summer...I hope that's ok! 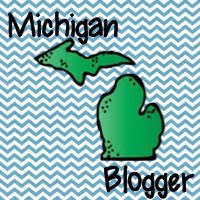 I love that we can find and support new blogs. Fabulous idea!! Love your new pets. 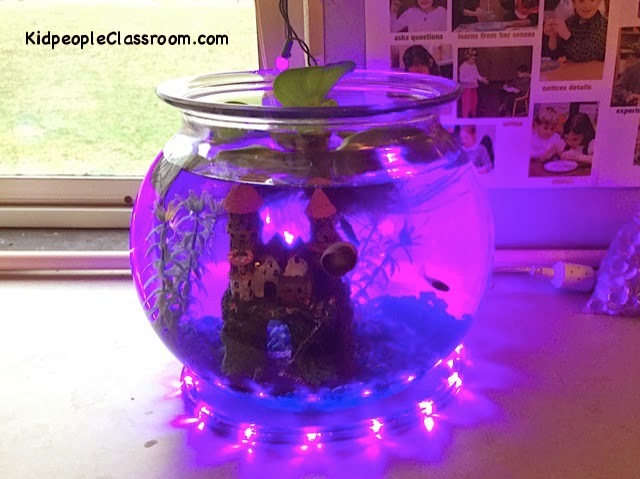 I have been wanting to get a classroom pet, but haven't for many of the reasons you listed. I am still on the lookout for the perfect pet. Love your "funny" kid. That is too much! Have a great week!